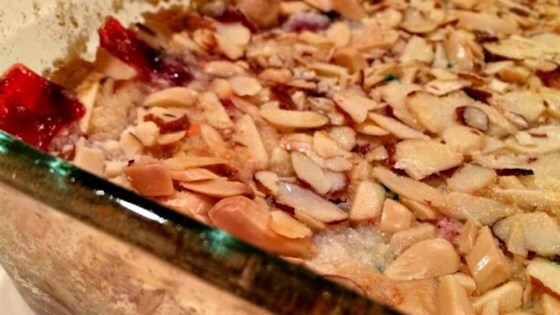 "This great, quick dessert can be made with either peach, apple, or cherry pie filling." Spread pie filling into the bottom of a 9x6-inch baking dish. Sprinkle cake mix over the pie filling; top with nuts. Drizzle melted butter over everything. Bake in preheated oven until the topping is browned, about 25 minutes. very simple and very good. I baked on 300 for about 10 minutes and then 350 for 15. it turned out wonderful. serve warm with vanilla ice cream.